Thursday August 17th 1899 I took an early start to town. The boys helped Willie and Stevens thresh. I found Lee better though he had needed the Dr. I took Mother over to the old Setlers picnic. enjoyed it as well as the heat would let us. I got home to do evening work. 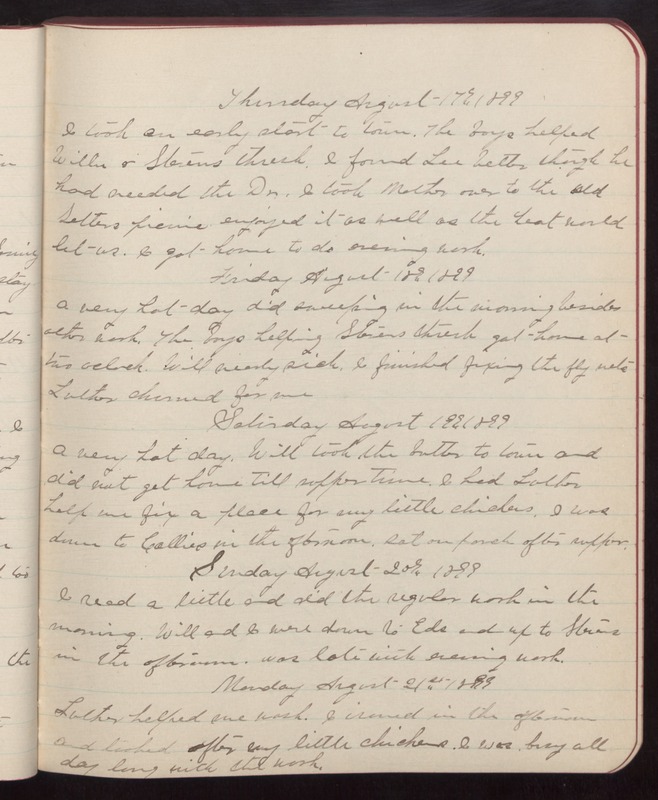 Friday August 18th 1899 A very hot day did sweeping in the morning besides other work. The boys helping Stevens thresh got home at two oclock. Will nearly sick. I finished fixing the fly nets Luther churned for me Saturday August 19th 1899 A very hot day. Will took the butter to town and did not get home till supper time. I had Luther help me fix a place for my little chickens. I was down to Callies in the afternoon. Sat on porch after supper. Sunday August 20th 1899 I read a little and did the regular work in the morning. Will and I were down to Eds and up to Stevens in the afternoon. was late with evening work. Monday August 21st 1899 Luther helped me wash. I ironed in the afternoon and looked after my little chickens. I was busy all day long with the work.